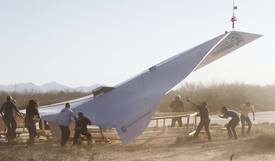 Marilyn writes, "A part of its Giant Paper Airplane Project to get kids psyched about aviation and engineering, the Pima Air & Space Museum launched what may be the largest paper airplane (45-ft-long, 800 lbs, with a 24-ft wingspan) from a helicopter at 2,700 feet over the Arizona desert. It flew (glided actually) about 7 to 10 seconds before crashing. >From the LA Times: ...The plane was constructed of layers of falcon board, which Vimmerstedt described as a type of corrugated cardboard, similar to a pizza box. The plane was designed and built in Lancaster by Art Thompson, who helped design the B-2 stealth bomber, but the design was based on a paper airplane folded by 12-year-old Tucson resident Arturo Valdenegro—winner of a paper airplane fly-off sponsored by the Pima Air & Space Museum in January. In a video interview with the museum on the day of the launch, Valdenegro said before the Great Paper Airplane Project he thought that he might pursue a career in engineering, but after meeting Thompson and seeing his plane realized in giant size, he now knows he’s going to be an engineer when he grows up..."
» Ask Slashdot: The Very Best Paper Airplane?